Elliotminns is a passionate Software Engineer who has experience working with several challenging projects. He is a computer science graduate from the University of Northumbria, in Newcastle. 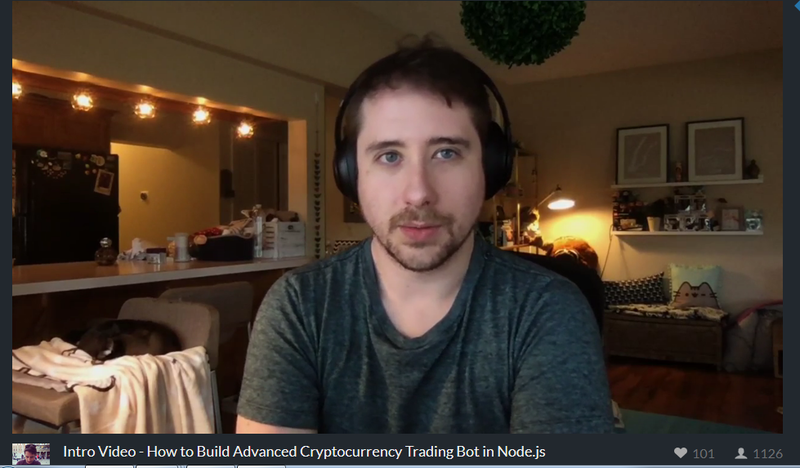 Elliotminns will be tackling this project: How to Build Advanced Cryptocurrency Trading Bot in Node.js. This project is in TEACHING mode. Furthermore, it’s a live and interactive project. You will see him building the trading bot in real-time. You can also chat directly with him whenever you get stuck. Starting Date: Tuesday, April 3rd 2018. Cryptocurrencies, such as Bitcoin and Ethereum, have revolutionized the financial world. From their obscure beginning, cryptocurrencies are now one of the most-sought-after digital assets. For example, Bitcoin is now worth amounts that were impossible to imagine a few years back. This project is about using Node.js technology to build an advanced bot for automatically trading cryptocurrencies. Is it exciting? Elliotminns will take you through all the processes for getting your crypto bot up and running—from setting up the project to deploying the bot for live trading. Are you excited about the growth of cryptocurrencies? Do you want to learn to build a bot that trades for you automatically while you spend your time doing other things? Do you want to advance your skills in Node.js? If you answered yes to any of the above questions, then this tutorial is the right one for you. You will learn how to use the Coinbase.com-powered GDAX API to build a trading bot to assist you profit from trading cryptocurrencies. After completing the entire eight sessions of this project, you’ll be able to develop an advanced bot for trading your favorite cryptocurrencies—such as Bitcoin, Ethereum, and Litecoin. If you want to delve into the exciting world of cryptocurrencies, this is your chance to learn from the experience of a professional. Besides, you can use the knowledge gained in this project build a commercial trading bot you can sell to crypto traders. It’s all up to you! Running with a live wallet if all went well. The project can be a great learning experience for those who want to develop a bot that instantly monitors the prices of cryptocurrencies, and automatically places buy and sell trades. The rapid growth of cryptocurrencies is taking the world by storm. Why should you be left behind? To access the project, you’ll need a LiveEdu.tv Pro account. The Pro account is affordable; it starts at only $9.99 month, which is less than $0.32 cents per day. If you subscribe to this project, you’ll also get access to other wonderful projects.